As the MOB, I worked very closely with the ladies at Bramblewood throughout the planning process and they were so wonderful to work with! They took care or every detail and were so available to us every step of the way! Bramblewood was the PERFECT backdrop for my daughter’s wedding! The barn is unlike any other- it is the epitome of romantic and elegant warmth! The ceremony site is honestly the most unique and breathtaking I have ever seen- and all of our guests raved about it! They have a great rain plan and the climate controlled cooling system in the barn is wonderful! Guest comfort and client satisfaction is their priority and it shows! I honestly can’t say enough about Bramblewood! Bramblewood created the wedding of our dreams! They are extremely organized and friendly, and the venue is absolutely stunning. Our guests are still telling us how beautiful and perfect everything turned out! I don’t even know where to start. Our wedding was September 1st, 2018 and Bramblewood is PERFECT. It was the absolute best day of our lives, all thanks to everyone at Bramblewood. From the day we picked our date they made the planning process so easy, organized stress free, and fun. The barn barely needed any decorations because it is already so beautiful. The cocktail lawn created such a cool laid back area for kids to run around and people to relax. 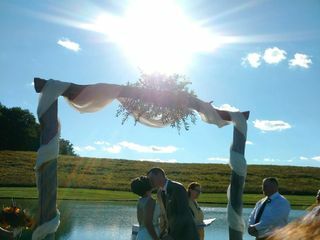 And, the pond at the ceremony site made the perfect backdrop for our vows and photos. I can’t say enough good things. They also did our flowers with their incredible farm wildflowers and I was obsessed. From the bright beautiful colors to the greenery runner on the tables, I couldn’t of dreamt up a better floral display, or a better day. Thank you thank you thank you Bramblewood for absolutely everything! You all are amazing. I’ll be wishing I could relive that day for the rest of my life! We had the most amazing wedding at Bramblewood, and I honestly don't even know how to begin expressing how wonderful it was. From the moment we stepped onto the property for the initial tour, I knew that this was the place I wanted to get married. It is absolutely gorgeous, from the barn, to the pond at the ceremony site, to the bridal suite in the house. We booked a date before we left that day, and from that point on, they made the process so easy, and were incredibly helpful every step of the way. They are so organized, kept me on track, and helped me keep my sanity throughout the entire planning process. Their decor collection is amazing, and I hardly had to do anything in terms of decorating the space-it is gorgeous all on its own! The day of the wedding was absolutely amazing, and I can't say enough about how incredible Emma, Bethany, Cindy, and the rest of the Bramblewood staff were to make sure that everything was perfect. They went above and beyond in their efforts to make our day everything we wanted it to be. There was rain on the radar right around the ceremony time, but I had my heart set on getting married outside, and they made it happen. They flawlessly orchestrated the outdoor ceremony, then got us undercover just as the rain began. We also had some transportation issues at the end of the evening, and once again, the Simmons family went above and beyond to make sure that we all got to where we needed to be. Bramblewood is such an amazing venue. Our guests are still talking about how beautiful everything was, and I feel so lucky to have had the opportunity to get married at such a wonderful place. It is absolutely worth every penny, and if I could give more than five stars I would! 100% the best place to have a barn wedding! We couldn’t be happier. Everything was beautiful and completely taken care of by the staff. My husband and I spent our two year Engagement planning our dream wedding with Bethany, Emma and Cindy-- And it turned out to be exactly that! Incredibly professional, knowledgeable and thorough. Not a single detail went by without consideration. Bethany worked very close with us to make sure we were cool, calm and confident in the flow of our wedding and was hands-on with all of our vendors. Our guests continue to call us to let us know what a wonderful and beautiful wedding we had and that they hope to attend another wedding at Bramblewood in the future. If I could give them more than five stars, I absolutely would! How do I give Bramblewood 10,000 stars?!? I am still speechless after our wedding on September 30th. It was by far the best day ever and Emma, Bethany, and Cindy played a HUGE role in that! My vision came to life through all of their hard work and creativity. They were patient, helpful, and dedicated to our event. Everything about that day was ABSOLUTELY PERFECT in every single way. This venue is STUNNING and their service is TOP NOTCH. We hated saying goodbye to them at the end of our weekend. I would recommend them ten times over to anyone looking for a gorgeous rustic venue in Pittsburgh. You will love it there! I am honestly speechless when I look back to my wedding at bramblewood on September 9th. Bethany and Emma truly captured my vision! I cannot believe how perfect the entire day was, I did not have to worry about thing. There was ample staff to help the day run smoothly, everyone was very accommodating and so friendly. I will recommend this venue to everyone, because I just want to go back! Everything about it is beautiful from the staff to the venue. Bramblewood staff, we cannot thank you enough for making our special day everything we could have dreamed of! Thank you!!! I am not even sure where to start about Bramblewood... IF I COULD GIVE THEM 11 STARS I WOULD!!!! My husband and I just got married there this past weekend and the day was ABSOLUTELY AMAZING! It was literally a wedding fairytale!!! I am an event planner for work, so I am a control freak about things and final details are extremely important to me and Bramblewood literally took care of every last possible detail!! From the decor to the flowers, my cookie table, calling my vendor to everything in-between they had every single detail of my day planned out and it went off so perfectly. Every single appointment I had with them they were 100% on top of everything. Cindy, Emma and the rest of their staff were so kind and helpful with everything and Bethany is literally a wedding fairy godmother! She literally made all my wedding dreams a reality! I honestly cannot say more positive things about them. From the moment you sign your contract with them they take care of every single detail. The venue is absolutely beautiful, everything is so clean, they are super flexible and so easy to work with. We had about 200 people at our wedding and it could not have been more perfect. I had people coming up to me all night long say how beautiful the ceremony site and the barn were. They commented how amazing every single detail of the day was. The Bramblewood staff made everything so easy for us! When we initially started looking at Barn venues we went to 3 different venues- this one being our 4th and I knew right away this was the way to go!!! If you are getting married and looking at doing a barn wedding you should 100% have your wedding at Bramblewood! They are literally the best ever!! There were definitely a few things throughout the day that didn't go as planned with my other vendors like the transportation showing up late and the DJ showing up 1 minute before the ceremony started but Brambelwood was so professional and had a backup plan for everything. They are the best!!! Bramblewood is AMAZING! They might be a newer venue, but you'd never know!!! They are all so organized and very professional! The venue is absolutely gorgeous.....and have you seen the ceremony site???!!!! It's truly breathtaking! It is worth the money, I can promise you that! The entire family is hands down one of the sweetest, most helpful people I've ever met! Bethany and Emma were a breath of fresh air to work with! They were consistent, reliable, and always professional. They responded quick when I would contact them. They had every single detail organized at any given moment! It was so incredible! The day of our wedding was very stressful due to the weather. I was determined to get married at the ceremony site outside, (despite the on/off rain ALL day) and Bethany and Emma made it happen. Even during my bridezilla moments, they were calm and collected all day no matter what happened and I can assure you that ALOT was happening (not going as I had hoped) between the rain, trying to get pictures with the rain, changing the schedule due to the rain, etc. But they stayed positive for me and worked with me 150% all day UNTIL the VERY end of the night! I have never experienced getting married before, but I sure am grateful that I had such amazing people to help plan and execute my event! It was worth every penny. Even our guest can't stop talking about how amazing the wedding was! We got married at Bramblewood on June 10th, 2017 and it was the most perfect day we could ever imagine. From the first contact with Bethany and Emma at Bramblewood, they were beyond accommodating and so wonderful. You can tell that they love what they do. They were very responsive with every question we had and they make sure that you don't miss a single detail when planning your wedding there. The barn was absolutely beautiful. We lucked out with perfect weather for the outdoor ceremony and cocktail hour. Throughout the whole day, Bethany and Emma, who act as day of coordinators, were both there to assist with anything we needed or anything our vendors needed. All of our vendors told us they love doing weddings there also, which definitely says a lot! We wouldn't change anything about our day and would highly recommend Bramblewood to everyone! We had our wedding at Bramblewood last night and it could not have been more perfect. First of all, the barn is just the most gorgeous piece of architecture, there could be nothing in it and it would have been an amazing wedding. But Emma, Bethany, and Cindy go so above and beyond with everything that it was truly the most magical wedding. The barn and lawn were decorated so beautifully (and there was literally nothing for me or my bridesmaids to do to get it ready!). They were patient with me when I was being high maintainence, kept us on schedule and moving all night, incredibly sweet, and just a great team to work with. People consistently came up to us all night to comment on how amazing the venue was. And I think my husband's comment today about sums it up: "I really want to go to a wedding there that's not ours, because it was such a fun place to be." I cannot say enough good things!! Bramblewood was spectacular. Between the venue and staff we could not be happier with our experience. Emma, Bethany, and Cindy were available through the entire process to help with questions, planning, and other logistics. They were very quick and kind in their responses. Wedding planning can be an overwhelming process, but they made many details much easier. Their catalog of decorations was spectacular with many options that compliment the venue perfectly. They also have a set of preferred vendors that made the process much easier. It was also reassuring knowing that our vendors had been to this venue previously. They assisted with setup, clean up, and the planning process. The barn and property are a stunning setting for a wedding. The property is large and inviting for guests to spread out and enjoy the day. We received so many compliments from our guests regarding the venue. If you are looking for an outdoor option or unique setting for a wedding, Bramblewood is a wonderful choice. We could not be happier with our decision to have our wedding there. Thank you Bramblewood! I can't express how happy my husband and I were with our wedding at Bramblewood! The place is absolutely beautiful! Cindy, Bethany & Emma made sure every little detail was perfect! We ordered all of our flower arrangements from Bramblewood & they were the most amazing arrangements I have ever seen! If you are looking for a barn venue look no farther, this is beyond perfect! My husband and I booked Bramblewood the minute we saw it. It is absolutely beautiful and our guests felt the same way after they saw it. Everyone loved it and raved about how pretty it was all night. Bethany, Emma, and Cindy are fantastic wedding coordinators and I was not worried about anything the day of our wedding! Everything ran so perfectly because of them. It is also affordable and you are able to pick your caterer and bring in your own alcohol. I highly recommend this place to anyone looking for a barn venue. Perfect is the only word to describe this venue. During their first season (2015) ever of doing weddings, they were so professional the entire time and it had seemed like they had been doing this for years! Everyone from the owner (Cindy), to the coordinators (Bethany and Emma), to the parking lot attendants, were professional and kind, and made my guests feel welcome. They were so accommodating and flexible. I highly recommend purchasing your flowers from this venue if you book with them. They were stunning, and extremely affordable; we received so many compliments!! The ceremony site was absolutely gorgeous and the spot of my dreams to marry my husband! Thank you, Bramblewood, for making our big day a day we will never forget. It was perfect! Don't pass this spot up! Best Wedding Venue is Pittsburgh! Couldn’t have had a better experience at Bramblewood! They did everything possible to make sure I had the best day of my life! If you want a perfect day with zero stress, choose Bramblewood! Bramblewood was absolutely amazing! My husband and I were blown away by their venue and how Bethany and Emma worked so well with us. They set up everything so perfectly. I couldn’t have asked for a better experience. Our wedding day on 6.16.18 ran so smoothly and they helped us with everything we needed. Our photographer even said it was the most beautiful venue she had ever been to. I highly recommend this gorgeous place. Thank you so much! If we could give them a 10 we would! My wedding was perfect! Bramblewood did such a great job! If you're looking to have some amazing photo's from your wedding, great food, and beautiful views everywhere this is the place to go. 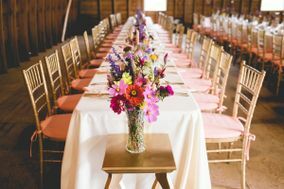 For a barn wedding we made it very glam and you can do what you want! They have a lot of extras you can use for center pieces and decor items around the barn and outside. That helped out a lot and saves you some money so you don't have 30 of these items that you won't use again. The flowers they use are beautiful as well straight from their garden! Everyone who worked there was amazing and helped you throughout the whole engagement! Farm to table and fresh everything is the way to go! I wish the wedding could of lasted longer, but we have a very memorable and amazing wedding! We had the wedding of our dreams at Bramblewood. I have so many wonderful things to say. First, pictures understate the beauty of this venue. The barn is so well kept and the craftsmanship is top notch. They installed a beautiful bar after we booked, and it was really an added bonus. And the ceremony site is absolutely gorgeous. We even lucked out with the most stunning sunset, which made for incredible photos and an amazing evening for us to enjoy. Our guests are still ranting and raving about our wedding even a month later. We will be for the rest of our lives. Second, Bethany, Emma and Cindy were incredibly wonderful to work with from start to finish. They were so organized, helped us through every little detail I never would have thought of, and they were incredibly patient with me during any changes, questions, concerns or anything that came up. They were also very responsive, too. I was impressed with how they ran everything from on our big day. You can tell they love what they do, and boy are they good at it. Third, Bramblewood offers a lovely collection of wedding decorations at no additional cost. If you're interested in this venue, you're probably interested in rustic wedding full of Pinterest-esque decorations. I was, and I didn't have to make a single thing! What a weight off of my shoulders. Every little detail was so perfect, even some of my male guests were commenting how perfect every little detail was (haha!). Some other particulars for anyone interested in this venue...we did buy the jars of honey as favors. I was really happy with the size, and our guests loved them, too. We also bought the air conditioning upgrade (admittedly we had a bit of sticker shock with the cost which we weren't expecting, but I believe this will be built into 2018 costs) and the barn was a wonderful temperature for our July 1 wedding, but it wasn't a blazing hot day. Many barns don't have air conditioning, so this definitely sets them apart!